Bored studying alone at home? Can’t find a place to work with your team? Desperately need an electrical outlet (or three) to charge your stuff? With spaces in 8 different buildings, look no further than the Library! No matter what you need or how you like to study, we’ve got the perfect setup for you. Check out our (entirely unscientific) take on the six kinds of studiers and their habits to help you find your perfect Library match. What kind of studier are you? The Solo Studier: you backpacked across Europe on your own and that’s how you prefer to study, too. 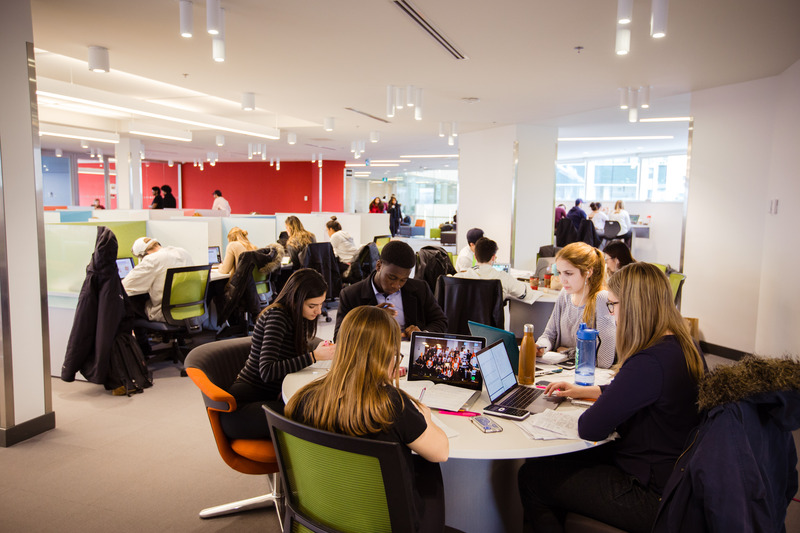 If you’re focused and like to do your own thing, you can stake your own cubicle in any of our main libraries: Morisset (MRT), Brian Dickson Law Library (FTX), Health Sciences Library (RGN), and the new Learning Crossroads (2nd and 5th floors, CRX). The Teacher: you already know everything (mostly), but it helps when you repeat it to someone else… and they benefit from your genius! Grab your squad and reserve one of our many group study rooms online or at a Library service desk. The Frequent-Breaker: you always get the job done and know how to stay upbeat doing it. Study in the MRT Media Centre for quick access to movies, games and more to maximize those essential breaks between cram sessions. The Socializer: if you wanted to study alone you’d have registered for a distance class. Make new study buddies by sharing the large tables in MRT, FTX, RGN or study in style and en masse in one of CRX’s fab new reading rooms. The Night Owl: you don’t register for a class before 2pm and would rather forget your textbook than your coffee. If that sounds familiar, then MRT’s 24/7 study space on the concourse level is for you – drop by day or night (probably night). The Multitasker: when your study essentials include your phone, Netflix and Instagram, you’re probably going to need outlets. Plug in just about anywhere in CRX and study, snap, insta and binge-watch away. When you aren’t borrowing a book or prepping for midterms, remember that the Library also offers unique activities, practical workshops and even special events! Stay up to date by following us on Twitter at @uOttawaBiblio and checking out biblio.uottawa.ca regularly! You can also give us a shout at bibliolibrary@uottawa.ca if you have questions or comments about our spaces.